It's been a while since I've restored a K-series automatic. I've done a lot of them already but there are still quite a few left to find. I was very happy to come across one for sale that was so beat up that I got it for a really good price. It's a 1955 Automatic K-351. This model was made for four years but you don't come across it very often. That may be because it has a solid 10K gold bezel with a stainless steel back and was more expensive than other K-models from the period. Like most K-series models, the K-351 has a 17 jewel Hamilton 661 movement inside. My K-351 was really dirty and the seller's photos didn't help. I was a little concerned that all I would end up with was a donor movement for a future project. However, once I had the watch in hand, I realized it might actually turn out well. 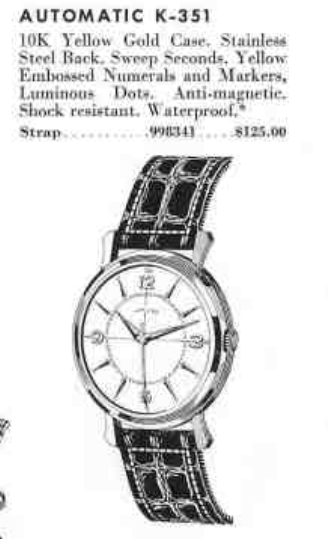 The first thing you notice when you look at the actual watch is the dial is more complicated than the catalog lets on. The dial has an interesting quadrant finish that changes depending on how the light hits is. It looks a little like a BMW logo. The pearled track inside the markers are actually gold colored. Since the model has a 5 as the second digit of the model number, this watch has a stainless steel back. I don't care much for this type of back design. The main cover is sort of pie-pan shaped and there's a threaded ring that engages the 10K gold bezel and tightens the cover on. These can be tricky to open and I had to soak this one with WD-40 to get it to loosen enough to thread off. This watch has a 1955 presentation to a gentleman from Des Moines. It's always interesting to investigate a watch like this to see if you can find information about the original owner. After a little searching I found him in the 1940 census, along with his wife and 1-year old daughter. I also found out he passed away in Las Vegas in 1999 at the age of 88. The 661 movement is a big and clunky automatic and the oscillating weight, sometimes called a hammer, is substantial. To remove the weight you just slide the little metal tab in the center to the left, in the direction of the arrow, and the rotor will lift off. The inside of the case back makes identifying the model easy. While everything is in the ultrasonic cleaner, I will prep a new GS PHD crystal for installation. The lume on the dial and hands needs to be redone, so I'll get out my luminous paint kit. This kit is expensive but you can do a lot of watches with it. You mix the luminous powder with the clear lacquer into a mixture a little more smooth than peanut butter but still fluid enough to spread. Then you apply the paint to the back of the hands and stick the hands into pith wood to dry. This dial has dots outside the hour markers so I'll put a tiny dollop in each space as carefully as I can. Putting the movement back together is easy once you get the train bridge on. Getting all four train wheels to line up can be a challenge but once you do, the bridge drops right in place. Four bridge screws hold it on. The reassembled movement is now running with good motion. It's off to the timer to see how well it's performing. It's running just a little fast, but that's easy to adjust. I'll tweak it once I get the dial and hands back on and put it back into the case. I'm in the home stretch now. Everything but the oscillating weight is back inside the case. Now I'll tweak the regulator to slow the watch down a smidgen. 10 seconds fast per day... I'll leave it right there. As you can see, this watch turned out excellent. Fresh lume, a new crystal and a nice genuine lizard strap complete the restoration. This is a sharp looking watch! Hi Dan. I found one of these I was going to buy….BUT, it has a red sweep second hand and doesn't seem to have the 2 tone face. Was there a model like this? It might be 1956.